Join Little Nutbrown Hare and his father, Big Nutbrown Hare, as they romp through more charming adventures! Fun-loving Little Field Mouse, mischievous Little Grey Squirrel and tricky Little Redwood Fox are back, as well as Little White Owl with her tales of mystery. Together the friends explore the meadows, forests and streams and on to Cloudy Mountain…playing, laughing and discovering the wonder that the world holds. The animated DVD, Guess How Much I Love You: The Song of Spring is really wonderful. It is super cute and has lots of life lessons to learn. 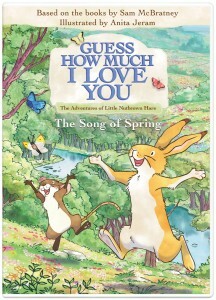 I especially like the main character, Little Nutbrown Hare because he is always so curious. If there is a problem he tries to figure it out. There are 7 different stories on this DVD based on the classic books by Sam McBratney. In each of the stories there is a mystery to solve and important lessons to learn. Every episode is about growing up and learning life lessons by friends helping each other. One of the episodes I especially like is the Busy as a Bee story. In this fun episode Little Nutbrown Hare makes a promise to help his father but really wants to play with his friend, Little Field Mouse. Little Nutbrown Hare learns a valuable life lesson; in this case, even when you may want to do something else like play with your friends, if you have already made a promise it is important to keep that promise. Another episode I really like is Little Green Worm. Here we learn some science facts such as discovering how a caterpillar turns into a butterfly. We also learn some cool science vocabulary like chrysalis, which means cocoon. The message of this film is to feel free to explore, don’t be scared and how having a friend at your side helps you get through anything. I love that this message is told through heartwarming stories about friendship, family science and more. I think the character voices are amazing and fit the characters just perfectly. The animation is simple, but very believable. The animated characters are adorable and all the stories take place in an animated forest and meadow that are beautifully colorful. I think viewers will love this DVD released by N Circle Entertainment because, overall there is a lot of heart, great messages and lots of educational lessons. It is a fun and an entertaining DVD. N Circle offers a nicely package product and they even include a fun craft activity. The animation and stories are simple enough for little ones to understand and, at the same time, offer good learning lessons for older kids. I give this DVD 4 out of 5 stars and recommend it for ages 4 to 8. Check it out! This collection of TV episodes is adorable. The hand drawn features are exquisitely detailed. It looks like just what I pictured it would in my head when I read the stories on my Leapster when I was younger. It has a quaint fairy tale feel to it with huggable characters. It is a fun collection to watch. The DVD comes with seven episodes that flow flawlessly together and it is easy to sit and watch the whole collection although your face might hurt from smiling and giggling too long. It was refreshing to sit back, chill and watch a DVD that was easy to watch and made me smile. The Little Green Worn is my favorite episode because I laughed out loud while watching the animals investigating their newfound insect. My favorite character is Little Nutbrown Hare. I like seeing how he interacts with all the different animals. His relationship with his father is adorable. He spends his days playing in the meadow and discovering mysteries and, with the assistance of his father and the other animals, they learn many new things and solve mysteries. They think up different ways to express their love for each other – “as much as all the insects in the meadow,” “bigger then the moon,” and things like that. I find this to be a cute game that all parents should play with their children. This game applies to any relationship. It is a fun way to express our feelings towards others and is very fun and loveable. One of my favorite things about this series are the voiceover talent. They are perfect. They matched the characters wonderfully. For example, the tiny characters have small, squeaky and adorable voices. All the animals are cute, huggable and each one has a different personality that makes you love them and smile each time you meet another one. It makes you want to jump through the TV and play in the meadow. This is a perfect way to get into the spirit of the spring season after a long winter. Easter is on its way and these hare-based stories are perfect for the holiday. They offer a good refresher course on basic science and have many learning lessons. The best lesson is that things change. I recommend these stories for kids age 3 to 9. Older kids might like it as well because, although they already know the lessons this DVD teaches, many kids might enjoy remembering what life was like when they were younger and seeing how much they have learned. I give this movie 5 out of 5 sparkling carrots.